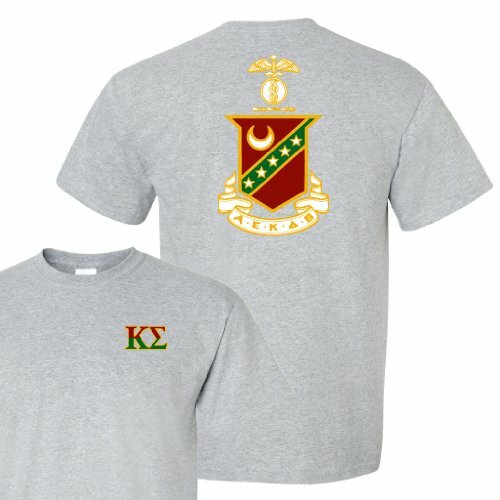 Kappa Sigma Standard T-Shirt - Crest Design on Back (large, Athletic Gray) by VictoryStore at SCRHI. MPN: 43230-136906. Hurry! Limited time offer. Offer valid only while supplies last. Show off your house spirit in a comfortable and stylish way with our amazing Kappa Sigma T-shirt. This wonderful shirt is made from 6.0 oz. Show off your house spirit in a comfortable and stylish way with our amazing Kappa Sigma T-shirt. This wonderful shirt is made from 6.0 oz. pre-shrunk 100% cotton and features our Kappa Sigma crest on back design. Our designs are printed digitally in full-color and are durable enough for washer use. Our shirts are designed for comfort and style, featuring our double-needle stitched neckline, bottom hem and sleeves. The quarter-turned, shoulder to shoulder tapering and seven-eighths inch collar will provide maximum comfort and a perfect fit. This shirt is a perfect gift for any Kappa Sigma fan or alumni. Our company is located in a school that was shut down, not new construction taking more Iowa farmland out of production. We have maintained the facility so that it continues to be used by community youth groups for recreational activities. 煌ustomer service is paramount, we aren't happy until our customers are happy. ✔We will always make a real human available to you by calling our office during standard business hours. ✔We will strive to provide an affordable, fair price for our products. 煏inally, we will always work to provide a product that exceeds customer expectations for price and delivery time. VictoryStore.com was founded by Steve and Kelli Grubbs and is still a family business located in Davenport, Iowa. We are a source of party supplies, campaign, team, special occasion outdoor yard signs. Realtor and other products like custom socks, vinyl banners, and promotional products are also available. See our other apparel options and use your Amazon gift card at our Amazon storefront. GREEK - Our Greek apparel is a great way to proudly display your Kappa Sigma spirit at your next event or function. You can also use them as fundraisers. We have many choices including t-shirts, sweatshirts, and jerseys. Let everyone know what your favorite Greek house is! VICTORYSTORE APPAREL - This wonderful shirt is made from 6.0 oz. pre-shrunk 100% cotton and features our Kappa Sigma Crest on Back design. Our designs are printed digitally in full-color and are durable enough for washer use. Our shirts are designed for comfort and style, featuring our double-needle stitched neckline and sleeve print. The quarter-turned, shoulder to shoulder tapering and seven-eighths inch collar will provide maximum comfort and a perfect fit. QUALITY MADE - All of our apparel items have full-color graphics and are made from high-quality materials for elegance and extra durability for comfort and wearability. BEAUTIFULLY DESIGNED APPAREL - VictoryStore features more than 2,000 shirts, cards, outdoor signs, yard cards and lawn and patio signs for all occasions like retirement, graduation, wedding, holidays, as well as birthday, wedding, anniversary, and many more. FAMILY BUSINESS - Founded in 1999, VictoryStore.com has been a pioneer in the design-your-own space for Christmas decorations, party supplies, promotional products, big cards, t-shirts, women's clothing, gifts including can coolers, as well as yard, patio and outdoor lawn decorations. Founded by Steve and Kelli Grubbs and is still a family business located in Davenport, Iowa. If you have any questions about this product by VictoryStore, contact us by completing and submitting the form below. If you are looking for a specif part number, please include it with your message.